The box beam shelf design and double-sided compression clips support loads up to 350 lbs. 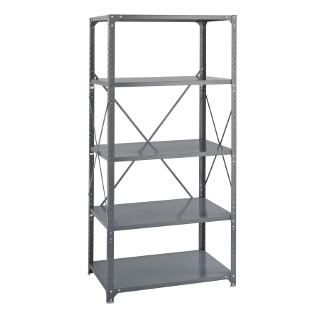 per shelf (based on a 36"W x 12"D shelf evenly loaded). Shelves can be easily repositioned in one-inch increments. Unit stands 75" in height and includes 4 posts and cross braces. Features corner brackets which help prevent rocking and improve overall stability and rigidity. A hat channel under every shelf increases overall strength. Durable Dark Gray finish.